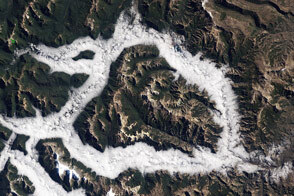 Thick fog snaked through valleys northeast of Vancouver in late February 2010. 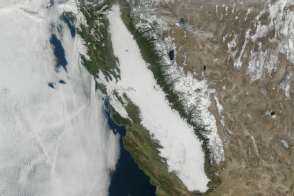 The Moderate Resolution Imaging Spectroradiometer (MODIS) on NASA’s Terra satellite captured these images at 11:35 a.m. local time (19:35 UTC) on February 21, 2010. 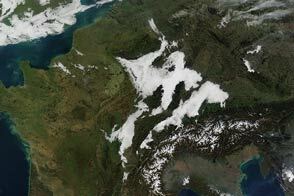 The top image is a true-color picture of the area, where the difference between fog and snow-capped mountain peaks is primarily one of texture. The bottom image uses a combination of infrared and visible light. 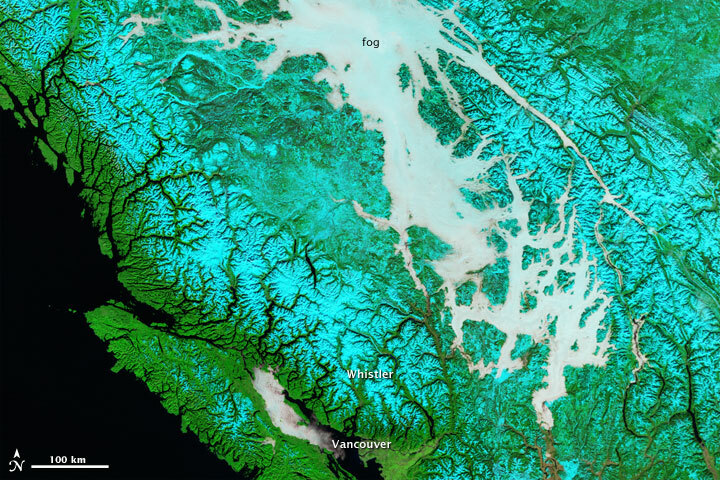 In the bottom image, vegetation appears bright green, snow appears bright turquoise, and fog appears as a very pale, muted blue-green. Fog is simply a cloud lying on the ground. Like all clouds, it forms when the air reaches its dew point, which is the temperature to which an air mass must be cooled for the water vapor in it to condense into liquid droplets. Valley fog is common in the Pacific Northwest. On clear winter nights, the ground and overlying air cool off rapidly, especially at high elevations. Cold air is denser than warm air, and it sinks down into the valleys. The moist air in the valleys gets chilled to its dew point, and fog forms. If undisturbed by winds, such fog may persist for days. 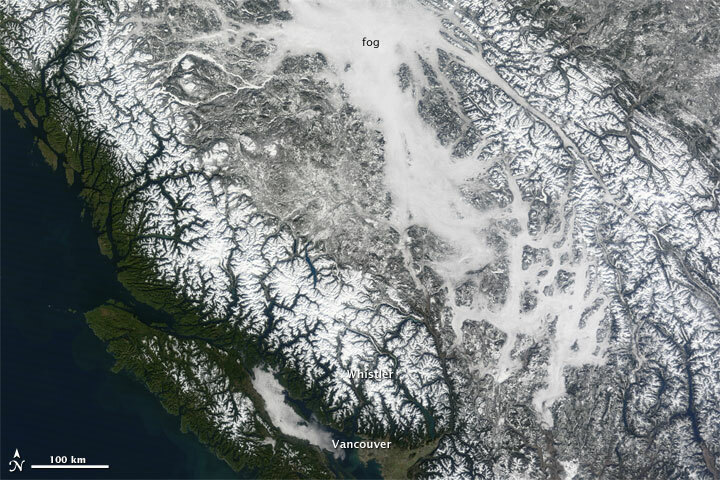 During the 2010 Winter Olympics in Vancouver, fog interfered with some events, but the fog in these images is well northeast of Olympic venues at Vancouver and Whistler. 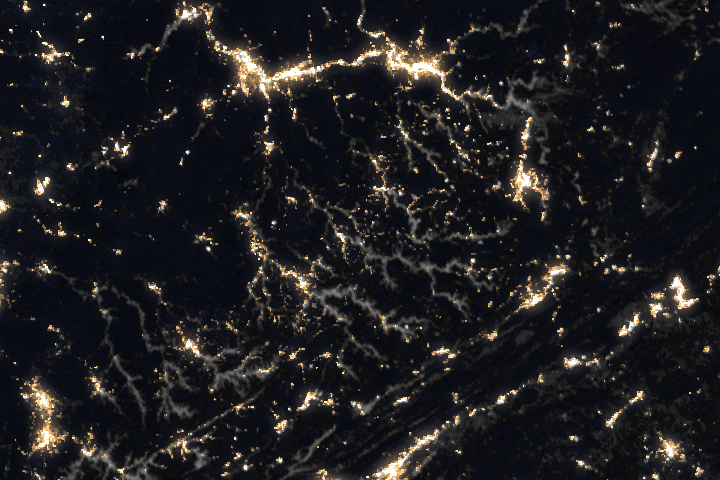 Additional true- and false-color imagery of this region is available from the MODIS Rapid Response Team. NASA Earth Observatory image created by Jesse Allen, using data provided courtesy of the Goddard Level 1 and Atmospheric Archive and Distribution System (LAADS). Caption by Michon Scott. 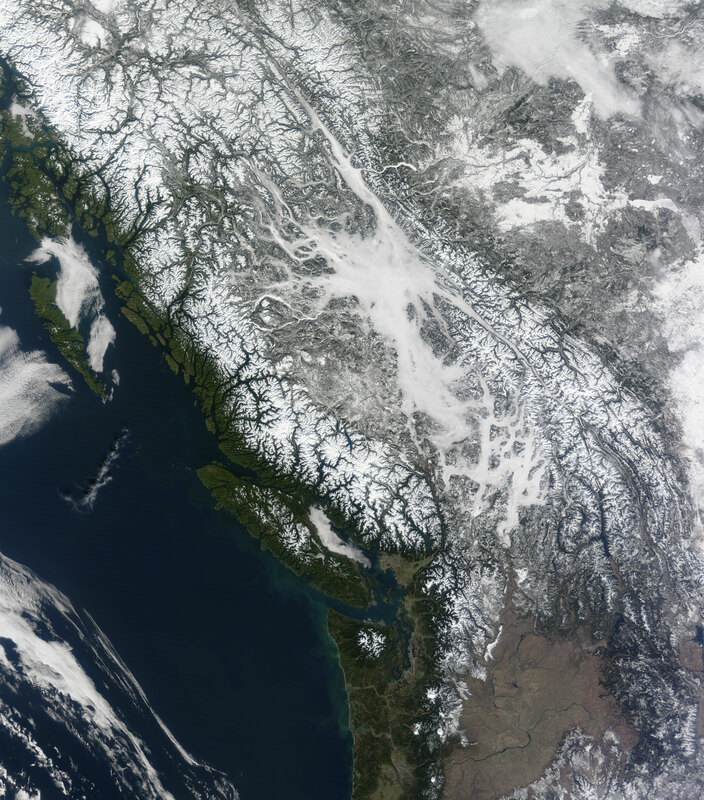 Acquired February 21, 2010, these true- and false-color images of British Columbia show fog filling mountain valleys northeast of Vancouver. 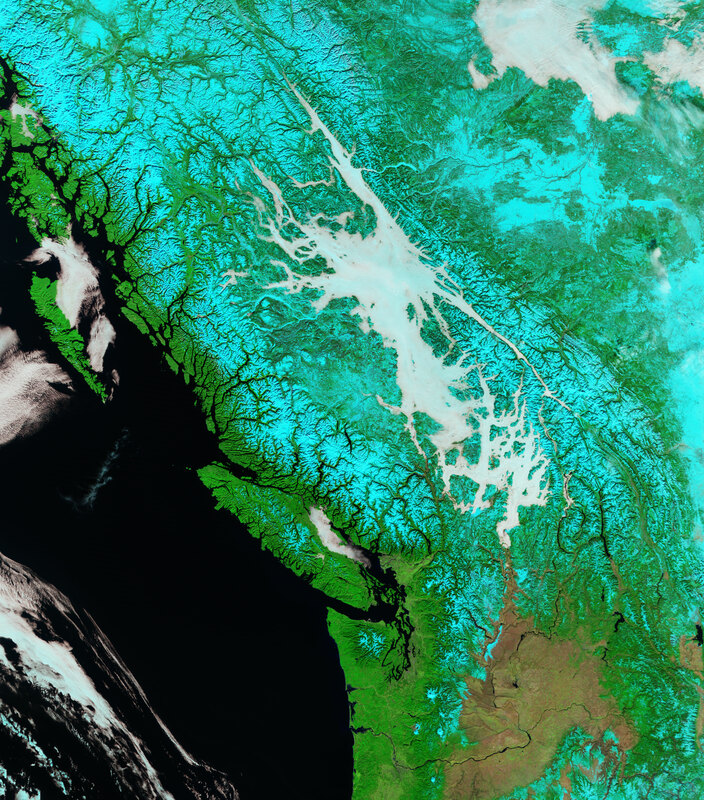 In the false-color image, vegetation appears bright green, snow appears bright turquoise, and fog appears as a very pale, muted blue-green. BBC Weather. Fog. Accessed February 22, 2010. Miles, K. (2007). Just About Everything You Wanted to Know about Fog. Accessed February 22, 2010. Sports Network. (2010, February 16). Fog greets snowboarders at Cypress Mountain. TSN. Accessed February 22, 2010.